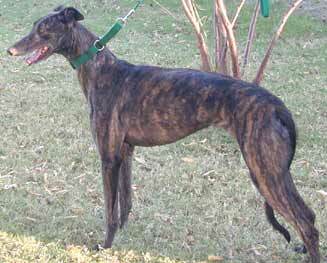 Gaia, formerly Claire, aka AZ Color Me Gone, is a beautiful dark brindle 4½-year-old female born August 26, 1999. Gaia's sire is OK For Real and her dam is TG's Lady Blend. Gaia finished her schooling, but never made it past her maiden race. Gaia has been in a home for over 2 years with another greyhound, but because of the family situation she needs to find a new home. She is an active beautiful little girl who is friendly and smiles a lot. She is extremely outgoing with a playful personality, and does very well with older children. Gaia is highly intelligent and learns very quickly. She does well in her crate, and loves to come and go with the door open. She gets along well with other dogs of all sizes and may possibly be cat trainable. Gaia will be an excellent addition to a family unit.